The Thinktank project intervenes at the meeting point between social development, artistic practice and technological possibilities. It develops an online working structure (group ware) for collaborative projects. Embedded in a user-friendly interface the Thinktank will offer new functions, which derive from research into collaborative dynamics. Since 2002 I am engaged and concerned with practices of socially engaged art in my own projects and through exchange with other artists. Social initiatives as the for-free movement and alternative economic systems as swap-rings have my genuine interest. My own back-ground in curating, co-coordinating an artist-run space, as much as working voluntarily for an art-newspaper and an artists-initiative has given me an eye for the amount of day-to day administrative work, depending completely on the engagement of volunteers. Essentially the projects, which I conducted and initiated myself, or which I joint out of interest have taught me to be aware of the energetic currents voluntary, self-organized collaborations are often confronted with. On one hand self-organized projects offer space for spontaneity and the pleasure of self-determination. On the other hand collaborators often exhaust themselves in provisory working environments in which they work often beyond their abilities, but try to manage everything at a time (multi-task workers). Self-organized initiatives often lack the network where skilled assistance can be requested (administration, translation, design etc) and the courage and knowledge how to avoid self-exploitation. In my experience artistic insights can offer a different views on and understandings of working processes, from the pressure of efficiency to process-oriented instead of result-oriented working. My background in a socially oriented art practice encourages me to try to transport this artistic collaborative knowledge into a medium accessible for society. New technologies / programming fascinate me as a tool, which offers the realm of the structural through which and in which society creates. To be able to integrate artistic thinking into these structures is for me a relevant step of artistic intervention and innovation. The Thinktank intends to carefully observe the areas, which it aims to interconnect; artistic, social and technological development. Therefore the Thinktank offers the process of developing a groupware as a negotiation field, in which partners from all involved areas are invited to contribute to its creation. – The Thinktank aims to respond to re-occurring difficulties in collaborative projects. It invites an interdisciplinary team of developers to improve these conditions by offering structural solutions in an online environment. – The Thinktank aims to interconnect related projects, which allows them to profit from each other's expertise, resources and knowledge. This can be a vital improvement for projects that operate with little financial and structural means. – The Thinktank aims to close a technical gap between cultural and social producers and the available Internet applications supporting group-work, taking into account that the state of current Internet applications is mostly oriented on the requirements of web-development projects. – Though the Thinktank is conducted as an artistic project it aims to develop an applicable tool, which can support the work of collaborating groups in their daily practice. The Thinktank targets self-organized, voluntary, de-centric projects in the cultural, social and political field, such as: Project-spaces and artist-initiatives, neighborhood and community work, transnational networks, small-scale collaborations and group-work, remote collaborations, theoretic and artistic collaborative projects, foundations and non-governmental initiatives. 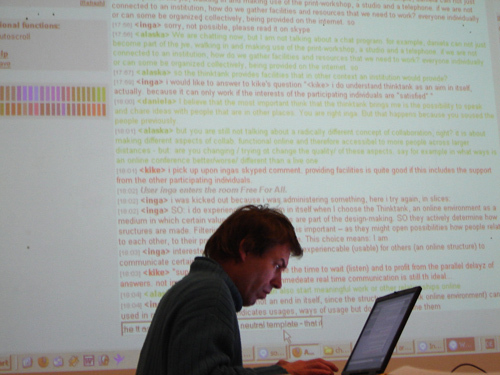 In the research phase the Thinktank invites its potential users to communicate their needs. What are wishes, expectations and requirements towards the Thinktank? How simple does the Thinktank have to be to match its users daily practice? Which functions have to be prioritized? Which grade of complexity is welcome and which unnecessary? By integrating its potential users in the development of the Thinktank (during the research phase and while testing and improving the group ware) the Thinktank aims to match the requirements of its users as closely as possible. The Thinktank offers a groupware development and research project in which users and creators work together. 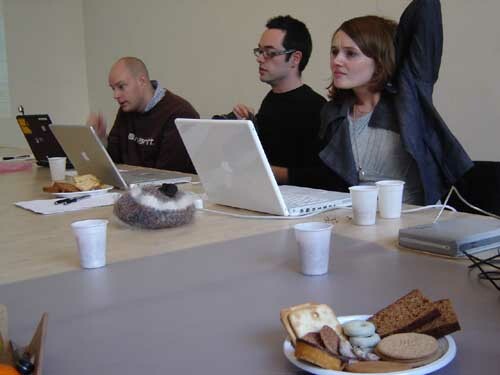 In the public research period (Dec 2005 – March 2006) artists, designers, programmers, architects, social practitioners and cultural workers are invited to contribute their ideas, needs, requests and suggestions to the Thinktank conceptual design. This investigation circles around issues which constantly re-occur in collaborations, such as trust, motivation, expectations, compensation, evaluation, efficiency and decision-making. – How can reliable agreements be made if money and contracts are not yet or: no longer valid negotiators? – How much negotiation is necessary between different partners to collect the necessary assets & energies to develop a successful initiative? – Which project stages can be activated to deepen the understanding of collaborative work and thereby generate more satisfactory working processes? – How much internal communication is necessary to create stable internal conditions (as for example trust), where objective rules do not regulate tasks, aims or working hours? 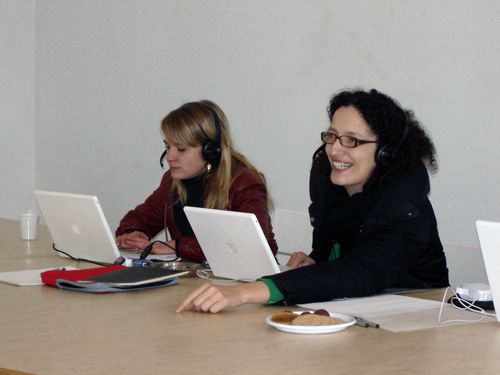 The experience gained in participatory art projects, in dialogue between heterogeneous groups, insights that artists have developed in interdisciplinary projects, as for example on economy (art & economy, interventionist practices), architects that engineer social structures of exchange (soft architecture) are invited to share their knowledge and make suggestions for functions, which the Thinktank can develop. The research and dialogue with different participants will take place through different formats: Through questionnaires, interviews, lectures, public talks and collaborative work physically as much as online. During the month of February the Thinktank opens a public office in the project-space Public Space With A Roof in Amsterdam in which guests engage with the development of the Thinktank. In collaboration with participants of the design-research project The Tomorrow Book, the Thinktank research will constantly be published online. To conclude the research phase a publication of the previous research into existing group ware tools and the emerging research into collaborative practices will be launched by March 2006. 1. The Thinktank is web-based, and requires no installment. 2. The Thinktank offers a very simple and intuitive user-interface, which makes this groupware attractive for regular computer users without advanced computer knowledge. 4. The Thinktank is modular, so that a working group can easily add to, adjust and extend its working environment. 5. The Thinktank interconnects autonomous projects to enable exchange of relevant information, resources and knowledge and thereby assists them to profit from each other's structural and methodological achievements. 6. The Thinktank helps to deepen the awareness for collaborative dynamics. Based on experiences gained in artistic participatory practices it offers functions, which respond to re-occurring difficulties at work in groups and offers constructive ways to implement them in collaborative processes. The Thinktank proposes to attach its development to an existing, well-functioning content management system. Two existing group ware / content management systems are potential candidates for the Thinktank: – The group ware Plone (written in Python) – The group ware Drupal (written in PhP) Therefore the Thinktank develops an easy to understand interface, which integrates functions of the existing group-ware. Programmers develop additionally those functions that were formulated in the research phase by artists and other practitioners. These functions, as decision-making, public participation, trust, inefficiency or project-evaluation are compatible with the existing groupware and thereby enrich the scope of online-applications. Available as an online-service and via the new interface this combination creates the Thinktank. This technical implementation offers the opportunity that the Thinktank connects to an existing developer's community, which makes it possible that the Thinktank is constantly updated as its programmer's community improves the original groupware. A team of 2 – 3 programmers will be commissioned to create the functions, which are conceptually developed during the research phase. Additionally it creates the new Thinktank interface. After a concentrated period of development, the Thinktank groupware will be released, tested and criticized by the conceptual developers of the research phase. The Thinktank will – Be released in English – Apply to world wide web standards – Be compatible with Macintosh, Linux and PC Though released under the GNU public license declared as open software, it is possible to install filters to restrict unintended usage of the Thinktank group ware. In order to reach non-advanced computer users in the social, cultural and artistic field a brochure will give an easy introduction to the Thinktank. This brochure will be distributed to foundations, cultural institutes and cultural innovative scenes European-wide. Announcements will be placed in relevant net-, and net-art related media as much as in printed media, which can attract the target group of social, cultural and artistic producers. The economists magazine brand eins, published in Germany, which introduces alternative models of entrepreneurship with social responsibility is a targeted media-partner. In cooperation with local partners (media-institutes as mi2, Zagreb, REX, Belgrade, InterMediaArtSpace, Sofia) the Thinktank should be translated into other languages from 2007 on, as for example Serbo-Croatian. Bridging organizations such as the transnational WITT-project, which operates transnational in Southeastern and Balkan countries, will be relevant partners to promote and distribute the Thinktank. The Thinktank aims to connect to ongoing, parallel and overlapping projects to integrate their different perspectives and achievements. By inviting different partners to co-create the tool, which can support their practices, it invites them to extend the Thinktank's applicability into their own working fields. The Thinktank also aims to connect interests, to create a broad base for producing the Thinktank with different individuals, initiatives and institutes. The Thinktank is a proposal for a groupware, an online collaborative environment, which offers practitioners from the artistic, social and political field online spaces for group work. During its research phase the Thinktank invites artists, architects, designers, programmers and people from the social and cultural field to envision with us what this working environment should consist of. As part of this research we are aiming to further our insights into modes, dynamics and values at play in collaborative work, investigating how they can be facilitated by virtual structures. Between Sunday the 19th and Sunday the 26th of February we are inviting participants to join conversations around specific aspects of (online) collaboration in the project space and via a virtual communication platform.